This 45 ACP Law Enforcement / Defensive load features a 230 grain BONDED JHP+P, which features a patented bonding technology to lock the bullet jacket and core. You’ve asked for it, and we’ve made it! 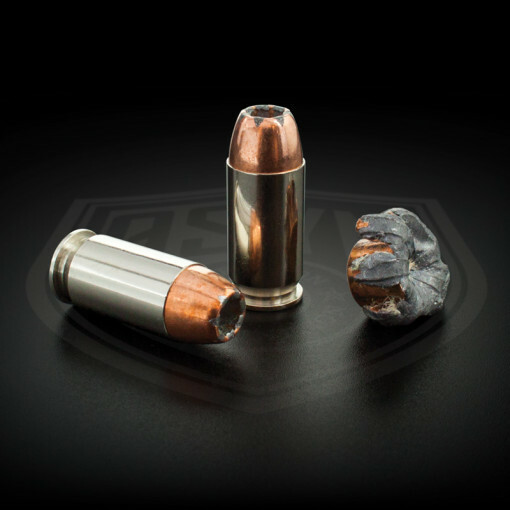 This 45 ACP Law Enforcement / Defensive load features a 230 grain BONDED JHP, which features a patented bonding technology to lock the bullet jacket and core. This ensures reliable penetration and expansion through intermediate barriers such as auto glass, without separation of the jacket from the core. This load features nickel plated brass casings. It is loaded with a high performance, very low flash premium propellant. It is loaded to a nominal velocity of 860 fps from a 5″ Colt Government Model barrel, which strikes the perfect balance between bullet performance, functional reliability, and controllability in all 45 ACP pistols, including concealed carry compacts.